All the way from the fanciest tables in London down to the simplest of family dinner parties in small towns, no English Christmas is ever complete without a generous serving of mince pies. But what makes the small pastries so special, and why are they such an essential part of the holiday tradition? Where Does the Mince Pie Tradition Come From? Mince pies have been around since the middle ages: back then the “mincemeat” filling really did consist of chopped meat, mixed with dried fruit and other sweet ingredients. Gradually, the meat disappeared from the filling and only suet (animal fat) and the chopped fruit remained. 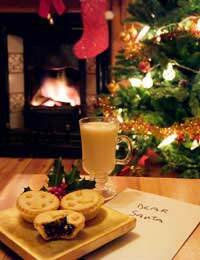 Mince pie became customary Christmas food somewhere in the sixteenth century. 1 lb of mincemeat (with or without nutmeg, cinnamon… depending on your taste. You can also stir in 2 oz of brandy, although this is of course entirely optional – but very tasty). Cut the butter into little cubes. Put the flour into a big bowl, and add the butter cubes. Now rub the butter into the flour until you get little crumbs of flour/butter mix. Add the icing sugar, and stir in. Add the two egg yolks and 4 tablespoons of really cold water. Knead the dough until it is soft and smooth, and allow to chill for half an hour while you preheat the oven to 200° Celsius. Sprinkle flour on your kitchen table top and spread out two thirds of the dough on it. Cut out 30 rounds (use a special cutter) with a diameter of about 2 ½ inches. Put them into bun tins, and fill them up with the mincemeat. Gather the rest of the dough, spread it out and cut out another 30 rounds, this time with a diameter of 2 inches. Slightly dampen the edges of the circles, put them on top of the pies and seal the edges. Beat the remaining egg, and use it to brush the tops of the mince pies. Bake in the oven for 20 minutes. Serve hot (or cold – they’re delicious both ways). Buy some ready to roll filo pastry, roll out and cut into squares (approx 10cm or 4' sides). Place a blob of mincemeat the size of a ping pong ball in the middle of each square. Brush melted butter around the edges of the square and fold across to make a triangular shaped parcel (a bit like a samosa). Cook following the instructions given for the filo pastry or until golden. Dust with icing sugar when cool. Whisk the egg white lightly. Sift the icing sugar into the egg white and whisk until you have a smooth paste. Roll the meringue into small balls and place a few on a microwaveable plate covered with kitchen roll. Microwave on high power for about 1 minute and 20 – 30 seconds. The balls will expand to create crispy meringues. When your mince pies have cooled, place a meringue ball in each one. Sprinkle with cocoa powder or finely grated chocolate as an option. Bake mince tarts as normal but again without a pastry top. Roll out some marzipan (or almond paste) and cut into star shapes. Once the tarts have cooled, place a marzipan star on each one. If you have the time (and the inclination), make some holly leaves with the remaining marzipan and some green food colouring and place a sprig in the middle of each star. Take a look at some more chistmas baking ideas.